PowerMax™ is an advanced online real time screen-based console for operators and contact center agents. 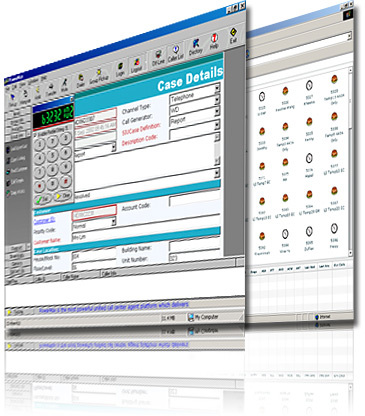 It is a set of PC-based graphical user interfaces that displays the details of calls and provides a graphical replication of all the telephone handset functions. All activities associated with a physical phone handset can be carried out via the screen-based interfaces. In today’s fast paced technological driven business world, communication is no longer limited to voice conversations. Text based communication such as email, fax and web chat are increasingly common. If native equipment are used for all these forms of communication, the operator will be physically stressed running around collecting faxes from the fax machine, downloading emails from the computer while attending to web chats and manning the telephone lines at the same time. These physical activities easily tire out the poor operator and form no part of his actual work; which is to handle incoming and outgoing communication. Screen-based consoles such as PowerMax™ solves this problem by offering a single common platform for all communication channels. With the PowerMax™, the operator needs only focus on a singular screen to receive faxes, emails, web chats, dial out and receive incoming telephone calls. In this way, he/she can put all his energy into carrying out his core function of managing communication. The PowerMax™ is an independent product that works with telephone systems. One example is the powerful PowerX2011™ telecom server. customer relationship management, fault monitoring, and any custom-built work processing systems that interacts with users through the phone system such as the PowerX2011™ telecom server. A phone system such as the PowerX2011™ telecom server constantly monitors all activities associated with the phone system in the background. Based on the criteria established, it collects required data for reporting purposes, display for online monitoring and other ad hoc purposes. When an optional module such the PowerMax™ console is incorporated into the phone system, it also mines the data for display in the console. The PowerMax™ agent console can integrate well with the phone system. As a result of this integration, the phone system automatically sends the desired data to the PowerMax™ console . The data is then converted to the required format and sent to the monitor for onscreen display. The speed of these processes is so fast that it is invisible to the naked eye. To the user (for example Contact Center agent), the online information is real time. When an activity associated with the phone is detected by the system, its captures it and displays it graphically through the PowerMax™ console. The PowerMax™ console is very versatile. It can be used to capture data from other communication channels besides the traditional telephony source. These channels include email, fax, SMS, internet, etc. Together with the data obtained through the communication channels, it can also pull data from legacy databases to form a rich database of information. This provides the source for the development of powerful monitoring tools for specific purposes. For example, a company may wish to monitor the processing of feedback through their Contact Center. The feedback may be made through the normal voice channel via telephone or mobile phone, Short Message Service (SMS) messages, voice-over-Internet-Protocol (VoIP), personal digital assistants (PDAs), web chat, internet questionnaires or surveys, email, fax, etc. The PowerMax™ console can provide online screen pop-ups for incoming communication and monitor the process from the moment the communication is received right through until a response is given to the customer and the case is closed. The monitoring process can be complex and involves fetching of data from backend legacy systems and updating non-telephony related databases. The PowerMax™ console can ploy the data collected and provide different graphical presentation of these data to the selected users in order for them. The rich source of data collected enables supervisors to monitor the progress of their processing system. In the example given, supervisors can follow the trial of each response and find out exact where and who is handling the response at any time. The Contact Center staff can read all the documents posted in relation to the case so that if the respondent calls up, the Contact Center staff can confidently respond to his enquiry. Operation Managers can track the total number of responses for each communication channel, type of responses, average turnaround time for handling responses and make supported evaluation on staff quality. They can also use the data for planning and selection of suitable training programs for upgrading the skills of existing manpower. Marketing Managers can also use the information to make accurate projections for resource management for instance on the type of communication channel to use for a specific promotion. The main purpose of the PowerMax™ console is to provide users with easy-to-read online data from the rich source of information available from a telephone system. One such example is the powerful PowerX2011™ telecom server. These information were thoroughly mined and arranged in graphical formats for the users’ convenience so that each user only sees what is relevant to his nature of work based on his login access rights. The PowerMax™ console enables selection of information to be displayed based on users’ requirements hence users will not end up being overwhelmed by excessive onslaught of data. They provide just enough data for them to focus on to carry out their work efficiently. The PowerMax™ console is able to update the information real time so that the users always work with the most up-to-date set of information. Likewise, supervisors and managers alike are also monitoring the latest progress of the flow of work. The PowerMax™ console contains options which integrate with telephone systems. The PowerMax™ console can support and is beneficial to all organizations; regardless of size. Ergonomical work flow: Without the PowerMax™ console , users, for example Contact Center agents, have to physically move around extensively in the course of a day’s work in order to man the phone hotlines, retrieve emails, collect faxes from the fax machine, draft the replies, print them out and physically bring them from the printer to the fax machine to send them out. This is because in the traditional mode of operation, a different equipment is used for each type of communication channel. The time spent in running around the different machines could be better served answering more enquiries. Besides, too much physical activity tires employees. With the PowerMax™ console , all user interactions with the customers are conducted via one common interface. For example, the Contact Center agent can receive and make phone calls through the screen telephone keypad, he can receive and reply emails and faxes via the same interface. He can also conduct voice-over-Internet Protocol conversations, web chats, etc through the same interface. Also all the tasks can be accomplished by the agent seated comfortably in front of his monitor instead of physically tiring himself moving around to handle the communication from the different sources. Lower cost of equipment: The PowerMax™ console can be seamlessly integrated into telephone systems such as the PowerX2011™ telecom server so a separate system is not required in order for the incorporation of this optional product into the PowerX2011™ telecom server. This means that there is no duplication of equipment for each product. This results in savings from wastage of purchasing additional equipment. Unlimited display of data captured: The PowerMax™ console can display all data collected by the telephone system. This provides the potential for a rich repository of data. As explained in the earlier section of this document, much can be gleaned from the information and the more data collected could only lead to higher quality reports and statistical analysis. The information will also be very useful for management planning and projections. Easy to learn: The design of the PowerMax™ console is such that it is very user-friendly. As the learning curve is short, not much time is required to be set aside for training of users. Ease of use: The design of the PowerMax™ console is such that it is very user-friendly. Besides the use of graphical symbols in the console, the arrangement of the data and layout can be worked out with the users. User acceptability: As the PowerMax™ console is very user-friendly and user involvement can be factored into the original design stage, the deployed product will receive greater user acceptability. Higher productivity: With the use of the PowerMax™ console , users work from one common interface. Time required to move around the office to manage the communication from different sources is saved. As less physical activity is involved, users do not need to burn more energy, causing them to be less tired. These factors enable users to handle higher workloads. Effective use of resources: The PowerMax™ console can be incorporated into telephone systems such as the PowerX2011™ telecom server without duplication of equipment. Its effective use of resources makes the installation of the PowerMax™ console space and cost efficient. Less space required: As the PowerMax™console can be incorporated into the same machine as telephone systems such as the PowerX2011™ telecom server, the company does not need to provide for additional floor space to house the equipment. Given the high cost of rental, this translates to more savings for the company. Extensive coverage: The PowerMax™ console can cover all the different types of communication channels; that is, voice communication via the normal cable phone, cell phone, voice-over-Internet-Protocol, Short Message Services (SMS), fax communication, email, web chat, communication via the internet, etc. Larger customer base: The wide choice of communication platforms expose the company to a larger customer base; made up of users from different communication media. More effective support: As the use of the PowerMax™ console enables users to operate from one central interface to handle multiple communication channels, they can provide more effective support to customers. For example, a customer sent an email to a company at 9.00am to change the time of delivery of a purchased item to 4.00pm. Later the wife called the delivery line to change the time of delivery to 2.00pm. With the installation of the PowerMax™ console, users work from a centralized source. Hence when the second communication is received, the staff is already aware of the first email communication and can resolve the difference in delivery times with the wife on the spot. Better management control: The user or Contact Center agent can also communicate with internal staff via the same interface. The PowerMax™ console can monitor activities in the entire supply chain from the beginning of the paper flow right through to when the matter is resolved with the customer. All staff on the supply chain logs into the system and updates their input via the different interfaces so that any authorized supervisor or manager can check on the flow of processes and know exactly what happened at each node and where the process flow is at any time. Escalation: The PowerMax™ console is built with powerful escalation abilities. This is configurable via graphical user interfaces. A few stages of alerts can be set based a set of criteria. Options are also provided for different communication channels. For example, if the escalation criteria is based on response time, the system will automatically notify a list of, say, Contact Center agents, once the first level of response time is exceeded. Alert will be carried out via the desired notification channel for individual members in each group. Hence while one member may be alerted via pager, another may be alerted via email. When the second level of response time is exceeded, the system will automatically alert another list of, say supervisors. As higher levels of response time is exceeded, different categories of management staff will be alerted. This enables supervisors and managers to step in and take charge when bottlenecks occur. Performance: With better control over the supply chain and paper flow being processed automatically by the system, it is expected that the resolution of matters be faster. Productivity: With improvement in performance, users such as Contact Center agents can handle more calls. The higher workload per user contributes to higher productivity. Improved customer service: With the improvement in performance and higher productivity, customers can be served within a shorter time, thereby improving customer service. Better customer relationship: Better management control also motivates staff to work harder to meet escalation deadlines. The improved customer service fosters better customer relationship. Higher return on investment: The increase in productivity leading to the lower costs of operation and the increase in income for the company from increased sales gives high returns on the investment of the optional PowerMax™ console . Increased sales: Better customer relationship usually leads to customer loyalty which in turn snowballs to repeat orders and referral sales. This increases sales and profit to the company.